Clear Correct Texarkana | Clear Braces Texas | Invisible Braces Arkansas - Andrew S. Curry, D.D.S. 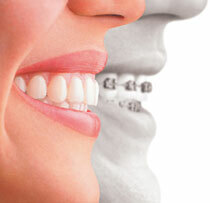 It used to be that, when you wanted a straighter smile, you had one option: traditional wire braces. Today, however, technology has come a long way, and it’s easier than ever to get the straight, beautiful smile you’ve always dreamed of. ClearCorrect is the clear and simple choice. With ClearCorrect, there’s no wires, no brackets — just clear, convenient comfort. ClearCorrect gives you every reason to smile. Gone are the days when you had to put up with unsightly and uncomfortable wire braces, but today, your dentist or orthodontist can straighten your teeth using a series of clear, custom, removable aligners. Invisible braces can revolutionize your smile, giving you the confidence to show off your smile with your head held high. As you can see, clear braces provide beautiful results that are equivalent to those gained from traditional wire braces, but without the brackets or wires. Plus ClearCorrect aligners can be removed, allowing you to eat more of the foods you love and keep up proper dental care throughout the teeth straightening process. Another reason why clear braces have become such a popular option is that they require fewer visits to the dentist than traditional braces, freeing up a lot more of your valuable time. Is ClearCorrect the right option for you? If you’ve been living with a smile that you’re just not happy with because of crooked or misaligned teeth, it’s time to find a solution you can feel good about. Clear braces are a popular option for many reasons, and while they work well for many people, they may not be the right option for you. Invisible braces aren’t ideal for all orthodontic cases, and before you decide on ClearCorrect, it’s important to schedule an appointment with our Top Rated Local® dentist in Texarkana, Dr. Andrew Curry for an evaluation to determine if invisible braces are the best treatment option for your needs. We are dedicated to helping you find the right solution for your dental needs.